Reading and share top 16 famous quotes and sayings about Flowers In Summer by famous authors and people. 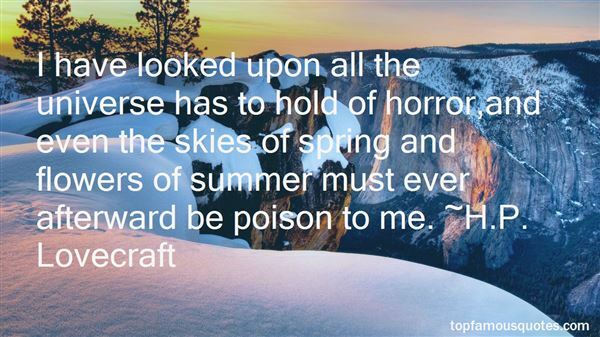 Browse top 16 famous quotes and sayings about Flowers In Summer by most favorite authors. 1. "The heat of the summer transformed the green grass into long brown straw, only the weeds were green. Claire didn't mind, the weeds had pretty flowers. Unlike Tony's flowers, which had been sentenced to his yard, gardens, or clay pots, these flowers grew free wherever they wanted. Furthermore, weeds were survivors. When all else died, the weeds remained. Yes, Claire liked weeds." 3. "The Eliots found it a queer sort of evening - a transition evening. Hitherto the Herb of Grace had been to them a summer home; they had known it only permeated with sun and light, flower-scented, windows and doors open wide. But now doors were shut, curtains drawn to hide the sad, grey dusk. Instead of the lap of the water against the river wall they heard the whisper of the flames, and instead of the flowers in the garden they smelt the roasting chestnuts, burning apple logs, the oil lamps, polish - all the home smells. This intimacy with the house was deepening; when winter came it would be deeper still. Nadine glanced over her shoulder at the firelight gleaming upon the dark wood of the panelling, at the shadows gathering in the corners, and marvelled to see how the old place seemed to have shrunk in size with the shutting out of the daylight. It seemed gathering them in, holding them close." 4. "Taking her hand he led her out into a broad stretch of hard sandy soil that the moon flooded with great splendor. They floated out like drifting moths under the rich hazy light, and as the fantastic symphony wept and exulted and wavered and despaired, Ardita's last sense of reality dropped away, and she abandonded her imagination to the dreamy summer scents of tropial flowers and the infinite starry spaces overhead, feeling that if she opened her eyes it would be to find herself dancing with a ghost in a land created by her own fantasy." 5. "For the city, his city, stood unchanging on the edge of time: the same burning dry city of his nocturnal terrors and the solitary pleasures of puberty, where flowers rusted and salt corroded, where nothing had happened for four centuries except a slow aging among withered laurels and putrefying swamps. In winter sudden devastating downpours flooded the latrines and turned the streets into sickening bogs. 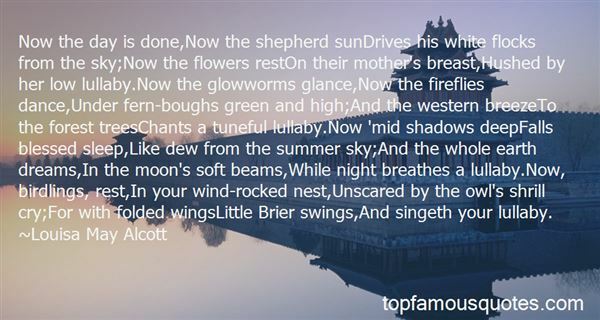 In summer an invisible dust as harsh as red-hot chalk was blown into even the best-protected corners of the imagination by mad winds that took the roofs off the houses and carried away children through the air." 6. "I have looked upon all the universe has to hold of horror,and even the skies of spring and flowers of summer must ever afterward be poison to me." 7. "The months came and went, and back and forth they twisted through the uncharted vastness, where no men were and yet where men had been if the Lost Cabin were true. They went across divides in summer blizzards, shivered under the midnight sun on naked mountains between the timber line and the eternal snows, dropped into summer valleys amid swarming gnats and flies, and in the shadows of glaciers picked strawberries and flowers as ripe and fair as any the Southland could boast. In the fall of the year they penetrated a weird lake country, sad and silent, where wild- fowl had been, but where then there was no life nor sign of life— only the blowing of chill winds, the forming of ice in sheltered places, and the melancholy rippling of waves on lonely beaches." 8. "94 was a good year to be twelve. Star Wars still had two more years as Box Office King, cartoons were still hand-drawn, and the Disney "D" still looked like a backwards "G." Words like "Columbine," "Al Qaeda" and "Y2K" were not synonymous with "terror," and 9-1-1 was an emergency number instead of a date. At twelve years old, summer still mattered. Monarch caterpillars still crawled beneath every milkweed leaf. Dandelions (or "wishes" as Mara called them) were flowers instead of pests. And divorce was still considered a tragedy. Before Mara, carnivals didn't make me sick." 9. "Season of mists and mellow fruitfulness,Close bosom-friend of the maturing sun;Conspiring with him how to load and blessWith fruit the vines that round the thatch-eves run;To bend with apples the moss'd cottage-trees,And fill all fruit with ripeness to the core;To swell the gourd, and plump the hazel shellsWith a sweet kernel; to set budding more,And still more, later flowers for the bees,Until they think warm days will never cease,For Summer has o'er-brimm'd their clammy cells." 10. "The best horror novels open up, "It was beautiful summer day and the smell of flowers emanated throughout the air." 12. "Catch me, Seth," she invited.He paused. "Faeries chase," he said, an then , with a flirtatious smile, he turned away, but before he could take a second step, she was behind him, arms around him, lips pressed against his neck. "I seem caught," he murmured.The Summer Queen whispered, "Me too. "And They fell together in a bed of flowers that now covered the floor"
13. 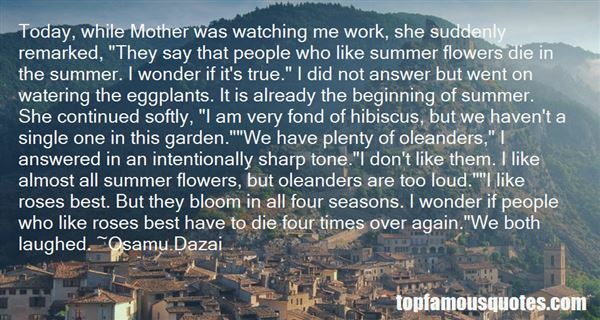 "Today, while Mother was watching me work, she suddenly remarked, "They say that people who like summer flowers die in the summer. I wonder if it's true." I did not answer but went on watering the eggplants. It is already the beginning of summer. She continued softly, "I am very fond of hibiscus, but we haven't a single one in this garden. ""We have plenty of oleanders," I answered in an intentionally sharp tone. "I don't like them. I like almost all summer flowers, but oleanders are too loud. ""I like roses best. But they bloom in all four seasons. I wonder if people who like roses best have to die four times over again. "We both laughed." 14. "...tell me the word that will win you, and I will speak it. I will speak the stars of heaven into a crown for your head; I will speak the flowers of the field into a cloak; I will speak the racing stream into a melody for your ears and the voices of a thousand larks to sing it; I will speak the softness of night for your bed and the warmth of summer for your coverlet; I will speak the brightness of flame to light your way and the luster of gold to shine in your smile; I will speak until the hardness in you melts away and your heart is free..."
15. "If I were you, Mr Lascelles," said Childermass, softly, "I would speak more guardedly. You are in the north now. In John Uskglass's own country. Our towns and cities and abbeys were built by him. Our laws were made by him. He is in our minds and hearts andspeech. Were it summer you would see a carpet of tiny flowers beneath every hedgerow, of a bluish-white colour. We call them John's Farthings. When the weather is contrary and we have warm weather in winter or it rains in summer the country people say that JohnUskglass is in love again and neglects his business. And when we are sure of something we say it is as safe as a pebble in John Uskglass's pocket." 16. "A BIRTHDAY Something continues and I don't know what to call itthough the language is full of suggestionsin the way of languagebut they are all anonymousand it's almost your birthday music next to my bonesthese nights we hear the horses running in the rainit stops and the moon comes out and we are still herethe leaks in the roof go on dripping after the rain has passedsmell of ginger flowers slips through the dark housedown near the sea the slow heart of the beacon flashesthe long way to you is still tied to me but it brought me to youI keep wanting to give you what is already yoursit is the morning of the mornings togetherbreath of summer oh my found onethe sleep in the same current and each waking to youwhen I open my eyes you are what I wanted to see." Everyone dreams of finding their soulmate. It's a universal quest. All over the world millions of people are looking for their true love, their amore thier ame soeur, that one special person with whom they will spend the rest of their life.And I'm no different.Except it doesn't happen for everyone. Some people spend their whole life looking and never find that person. It's the luck of the draw.If, by some miracle, you're lucky enough to meet the ONE, whatever you do, don't let them go. Because you don't get another shot at it. Soulmates aren't like buses there's not going to be another one along in a minute. That's why they're called, "THE ONE"."